Australian street artist Anthony Lister is currently in London and has been on a painting spree around East London. Street Art London hooked him up with this wall in Rivington Street today and spent some time in his company as he painted. The wall is next door to Cargo, the courtyard of which Banksy once famously painted and within which two of his works remain. Lister paid his own tribute to one of these Banksy pieces. Afterwards we spent some time with Lister and conducted an extensive interview with him which we will bring to you next week along with the rest of his work from his latest visit to London. In the meantime, sit back, and enjoy the evolution of Lister’s latest work in London. While RUN was painting the front doors of Tramshed (covered), Dscreet also put up a piece that same night around the corner on another door of Tramshed along Garden Walk. 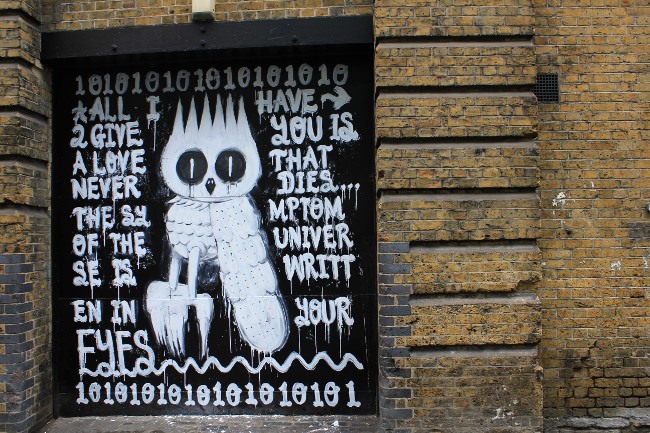 This work features Dscreet’s classic owl image surrounded by the lyrics of Black Sabbath’s song Symptom of the Universe. I first heard Black Sabbaths “Symptom Of The Universe” on Henry Sanchez’s “Pack Of Lies” seminal skate part from 92. The sickest skater in the world at the time and it was the heaviest soundtrack I’d ever heard on a skate section, a mindblowing combo got me psyched to roll everyday. 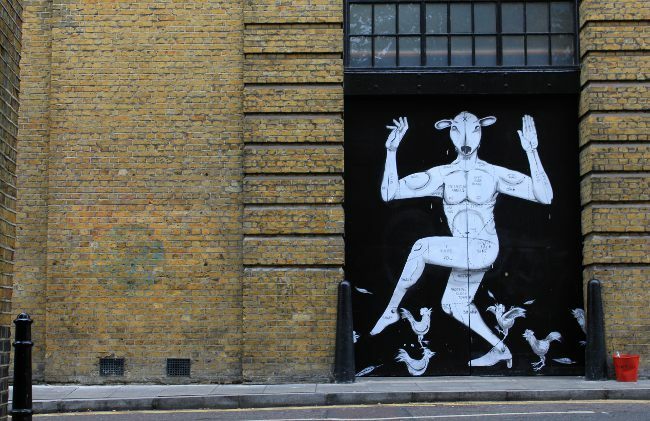 RUN and Street Art London were recently invited to paint the front doors of Tramshed, Mark Hix’s new restaurant in Shoreditch, notable for its commissioned Damien Hirst piece inside featuring a cow and a cockerel. Tramshed shuts its front doors at midnight and RUN had another painting date in Spain the next day so it was a race against time through the night. RUN however rose to the occasion and produced a stunning work. Recently, São Paulo based artist Flip visited London and put up this great piece on Ebor Street on the other side to ROA’s hedgehog. Street Art London got in touch to find out a little more about FLIP and the inspiration behind the wall…. Your new wall in Ebor Street is great. Can you tell us a little about the inspiration for this piece? The funny kawaii, monsters and non-sense inspires me. It’s also inspired by old Japanese mythical creatures, in this case, I mixed the Tanuki (Japanese raccoon) with the Jellyfish. I chose CMYK colors to pop up in front of the bricks … Seems to be alive ! Tell us a little about your artistic background and how you go into street art? I always wanted to be a cartoonist, then when I got to my teens a couple of my friends got into graff and tried to get me into it. We used to tag all the spots we skated and at some point drawing and piecing became more important to me than skating. Stik recently collaborated with the Dulwich Picture Gallery to re-create seven old master paintings from the Gallery’s collection around the streets of Dulwich. This project represents a daring collaboration between street artist and England’s first public art gallery. 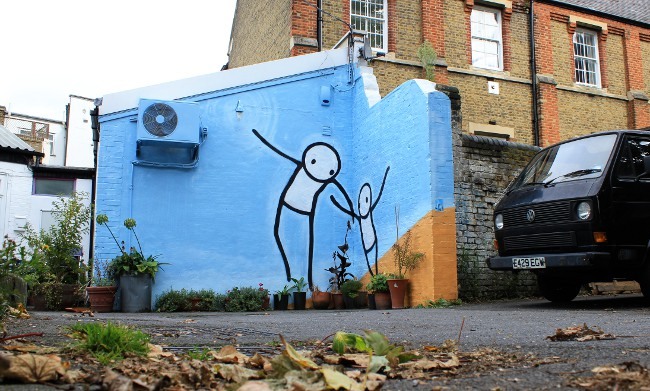 It is also refreshing to see Stik’s work and street art more generally transplanted into leafy and surbaban Dulwich. Stik found inspiration from regular visits to the gallery and then reinterperated and remixed the work into his own unique style. 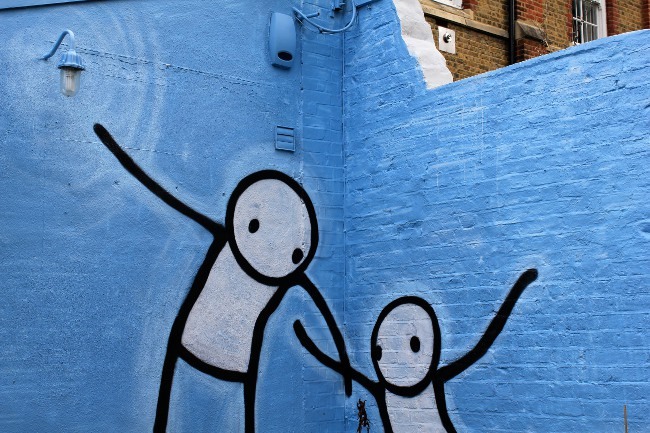 Stik’s simplification of the works in the street serve to highlight the universal nature of the themes expressed by the old masters. The piece below is Stik’s interpretation of Marcantonio Franceschini’s The Guardian Angel (1716), located at the Push Studios at Blackwater Court, Dulwich. 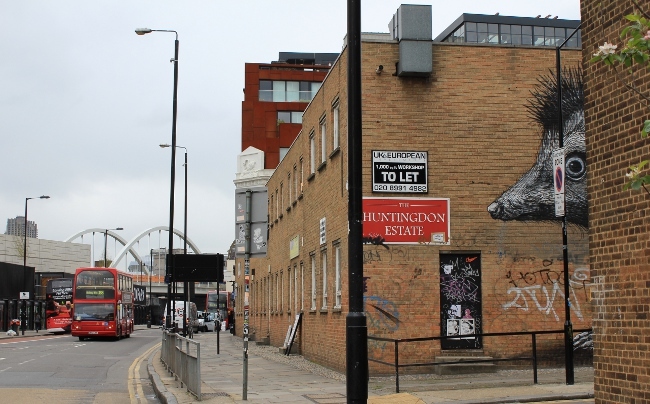 On Sunday ROA put up a great new mural on Chance Street in Shoreditch to mark his last night in London before jetting off to paint in Poland. This piece adds to his growing repoitoire of animals around London and caps off an extended stay that saw him put up one more street piece a few weeks back (see below), but more significantly put together a fantastic installation based gallery show entitled Hypnagogia. Last week, Sheffield based street artist Phlegm, put up an epic new piece just off Brick Lane on Heneage Street… This wall four other Phlegm pieces in London… notably this collaboration with ROA in Peckham. This huge wall took him a full three days to paint and well displays his characteristic black and white, illustrative style and stylised narratives that overflow from his self produced comics. 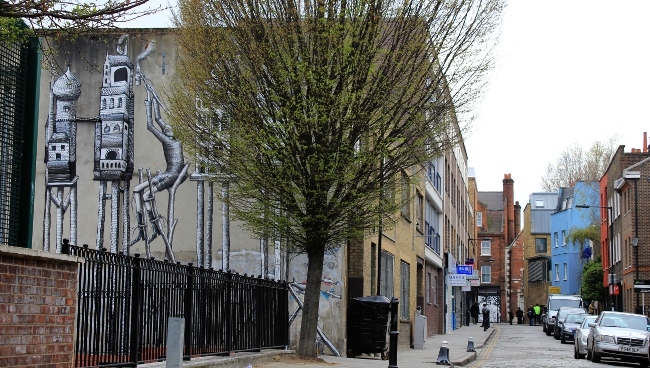 If you fancy tracking down this, and the rest of Phlegm’s street art in London, then why not use the Street Art London iPhone App – all of the pieces are on there and much more besides! We have been working on this baby for quite some time alongside Geo Street Art. We are pleased to finally release it. 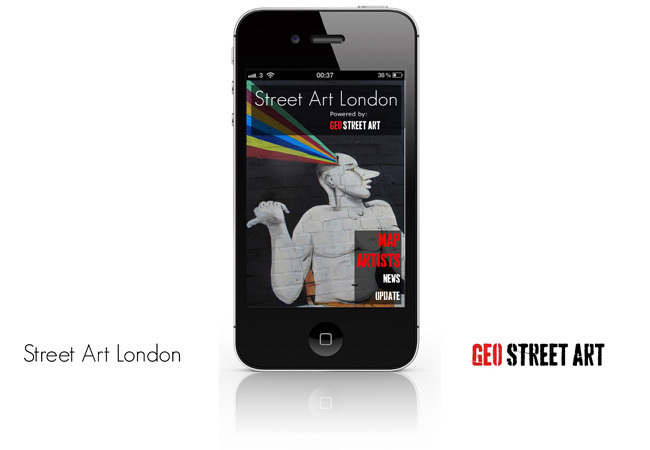 The Street Art London App presented by Street Art London and Geo Street Art guides you to the locations of London’s ephemeral street art using the GPS functionality of the iPhone. With an array of past and present pieces, the newly launched App represents a comprehensive reference point to the London street art scene with detailed artist biographies included. We have really distilled of their knowledge and resources into this App. 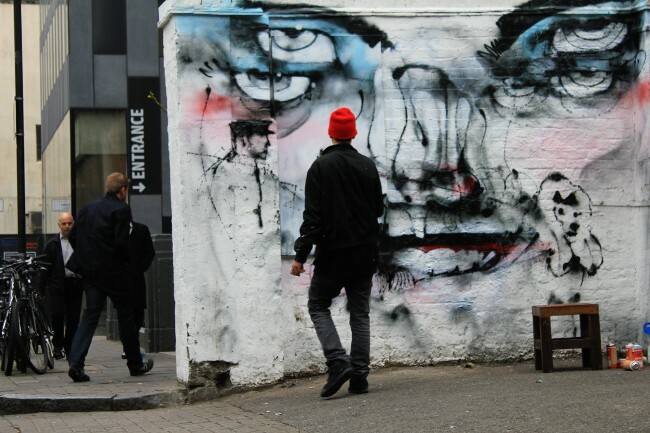 You can also share pieces from the App with your friends and read the Street Art London blog directly from the App. 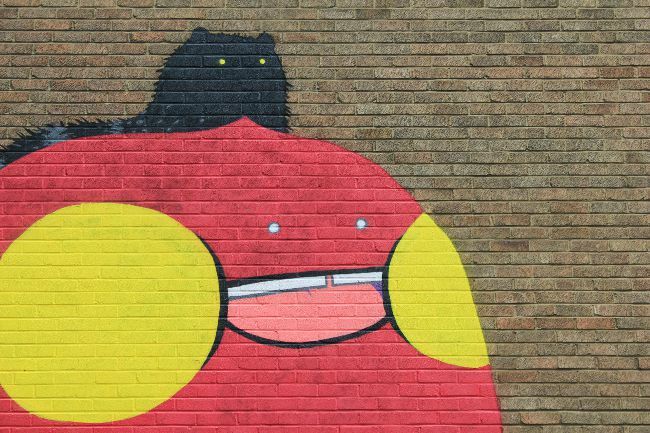 The App launches with close to 600 images from Street Art London’s archive, and features work from over 90 street artists. At launch, the App’s database contains over 270 locations in London that are waiting to be discovered using the App’s map interface. We will be constantly updating the App to ensure that the map always reflects what’s on the street. 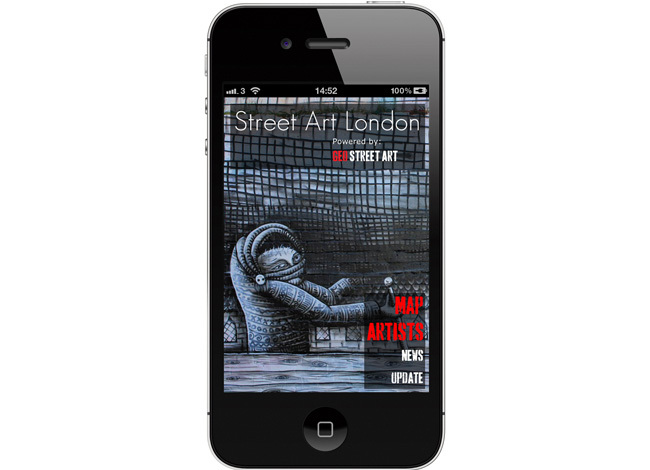 The Street Art London App, along with the Street Art NYC App, which is also launched today, represents the spearhead of the Geo Street Art Apps Project. More cities are on the way! We’ll be in touch soon to tell you all about the amazing features of the App. The App is available now in the App store for £2.99. 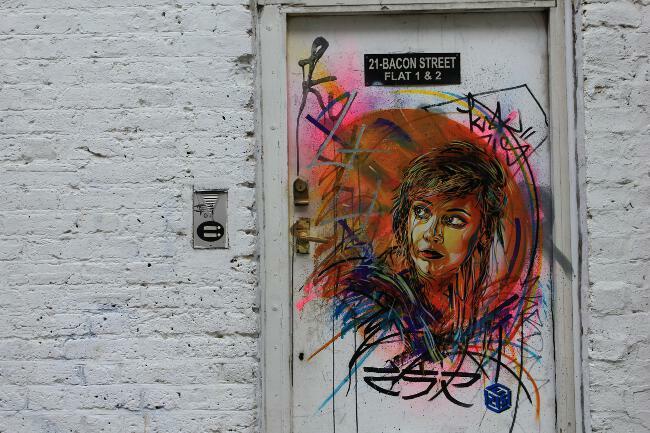 C215 has, in recent days bombarded Brick Lane with new pieces… in a similar vein to his last visit to London in July 2011. Street Art London went out and hunted a few of their pieces down… there are probably one or two more still out there that we missed…. 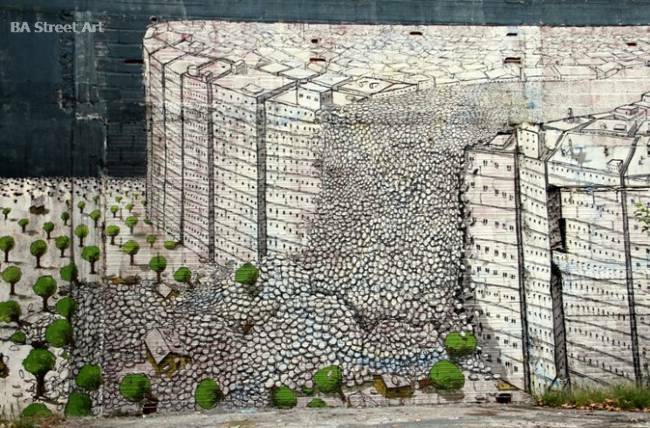 It’s certainly been a busy and exciting last few months for street art in Argentina. In November, BA hosted Meeting of Styles, the first ever international graffiti festival to be held in the country. 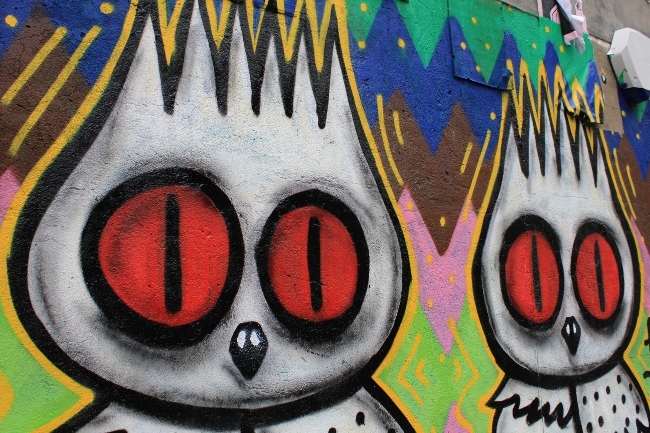 Some 130 street artists were painting at more than half a dozen sites around the city. Vhils from Portugal dropped by to destroy a wall in Palermo and Blu decided to spend the summer in the city. The Italian master ended 2011 in fine style by painting his last four murals of the year here in BA.